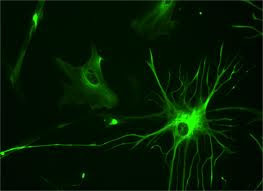 Tufts neuroscientists find that starry brain cells can be used to mimic sleep deprivation BOSTON (January 23, 2013) — Neuroscience researchers from Tufts University have found that our star-shaped brain cells, called astrocytes, may be responsible for the rapid improvement in mood in depressed patients after acute sleep deprivation. This in vivo study, published in the current issue of Translational Psychiatry, identified how astrocytes regulate a neurotransmitter involved in sleep. The researchers report that the findings may help lead to the development of effective and fast-acting drugs to treat depression, particularly in psychiatric emergencies. Drugs are widely used to treat depression, but often take weeks to work effectively. Sleep deprivation, however, has been shown to be effective immediately in approximately 60% of patients with major depressive disorders. Although widely-recognized as helpful, it is not always ideal because it can be uncomfortable for patients, and the effects are not long-lasting Marriage and Family Therapist Continuing Education During the 1970s, research verified the effectiveness of acute sleep deprivation for treating depression, particularly deprivation of rapid eye movement sleep, but the underlying brain mechanisms were not known. Most of what we understand of the brain has come from research on neurons, but another type of largely-ignored cell, called glia, are their partners. Although historically thought of as a support cell for neurons, the Phil Haydon group at Tufts University School of Medicine has shown in animal models that a type of glia, called astrocytes, affect behavior. Haydon's team had established previously that astrocytes regulate responses to sleep deprivation by releasing neurotransmitters that regulate neurons. This regulation of neuronal activity affects the sleep-wake cycle. Specifically, astrocytes act on adenosine receptors on neurons. Adenosine is a chemical known to have sleep-inducing effects. During our waking hours, adenosine accumulates and increases the urge to sleep, known as sleep pressure. Chemicals, such as caffeine, are adenosine receptor antagonists and promote wakefulness. In contrast, an adenosine receptor agonist creates sleepiness. "In this study, we administered three doses of an adenosine receptor agonist to mice over the course of a night that caused the equivalent of sleep deprivation. The mice slept as normal, but the sleep did not reduce adenosine levels sufficiently, mimicking the effects of sleep deprivation. After only 12 hours, we observed that mice had decreased depressive-like symptoms and increased levels of adenosine in the brain, and these results were sustained for 48 hours," said first author Dustin Hines, Ph.D., a post-doctoral fellow in the department of neuroscience at Tufts University School of Medicine (TUSM). "By manipulating astrocytes we were able to mimic the effects of sleep deprivation on depressive-like symptoms, causing a rapid and sustained improvement in behavior," continued Hines. "Further understanding of astrocytic signaling and the role of adenosine is important for research and development of anti-depressant drugs. Potentially, new drugs that target this mechanism may provide rapid relief for psychiatric emergencies, as well as long-term alleviation of chronic depressive symptoms," said Naomi Rosenberg, Ph.D., dean of the Sackler School of Graduate Biomedical Sciences and vice dean for research at Tufts University School of Medicine. "The team's next step is to further understand the other receptors in this system and see if they, too, can be affected." ### Senior author, Phillip G. Haydon, Ph.D., is the Annetta and Gustav Grisard professor and chair of the department of neuroscience at Tufts University School of Medicine (TUSM). Haydon is also a member of the neuroscience program faculty at the Sackler School of Graduate Biomedical Sciences at Tufts. Additional authors are Luke I. Schmitt, B.S., a Ph.D. candidate in neuroscience at the Sackler School; Rochelle M. Hines, Ph.D., a post-doctoral fellow in the department of neuroscience at TUSM; and Stephen J. Moss, Ph.D., a professor of neuroscience at Tufts University School of Medicine and a member of the neuroscience program faculty at the Sackler School. Hines DJ, Schmitt LI, Hines RM, Moss SJ, Haydon PG. Translational Psychiatry. "Antidepressant effects of sleep deprivation require astrocyte-dependent adenosine mediated signaling." (2013) 3, e212; doi:10.1038/tp.2012.136. Published online 15 January 2013. This research was supported by award number R01MH095385 from the National Institute of Mental Health, part of the National Institutes of Health, as well as by award number R01NS037585 from the National Institute of Neurological Disorders and Stroke, both of the National Institutes of Health. Dustin Hines was partially funded by the Heart and Stroke Foundation of Canada. Haydon is co-founder and president of GliaCure Inc., which has licensed a pending patent application filed by Tufts University claiming compounds that modulate the signaling cascades, and related methods of use, described in this paper. About Tufts University School of Medicine and the Sackler School of Graduate Biomedical Sciences Tufts University School of Medicine and the Sackler School of Graduate Biomedical Sciences at Tufts University are international leaders in innovative medical education and advanced research. The School of Medicine and the Sackler School are renowned for excellence in education in general medicine, biomedical sciences, special combined degree programs in business, health management, public health, bioengineering and international relations, as well as basic and clinical research at the cellular and molecular level. Ranked among the top in the nation, the School of Medicine is affiliated with six major teaching hospitals and more than 30 health care facilities. Tufts University School of Medicine and the Sackler School undertake research that is consistently rated among the highest in the nation for its effect on the advancement of medical science. If you are a member of the media interested in learning more about this topic, or speaking with a faculty member at the Tufts University School of Medicine or another Tufts health sciences researcher, please contact Siobhan Gallagher.